Switch between wired and wireless modes to enjoy free movement without sacrificing accuracy and control. Play wherever and enjoy your game. Reliable 2.4 GHz wireless technology provides stable wireless connection with up to 10 meters range. Designed to fit your palm, this mouse prevents unnecessary strain on your hand to enable comfortable grip and pleasant use even during your longest games. Confidence is good, control is better: Your VT350 offers you 11 individually customizable buttons to which you can assign a wide range of functions and macros. Built-in memory to save the mouse configuration (macro, CPI setting and breathing light mode) in the game mode. You can play the way you want it, on any computer without the help of any software. You can adjust 5 CPI values from 200-5000CPI through CPI+/- buttons, which is up to 5000CPI. You can also +/- CPI recurrently with an interval of 100 CPI to meet the accuracy of different screens. Professional gaming optical engine with 100 inches / s tracking speed, Max.acceleration of 20G and up to 1000 Hz USB report rate, ensures accurate tracking, anytime, anywhere. What does it do? It turns blue, green, or... 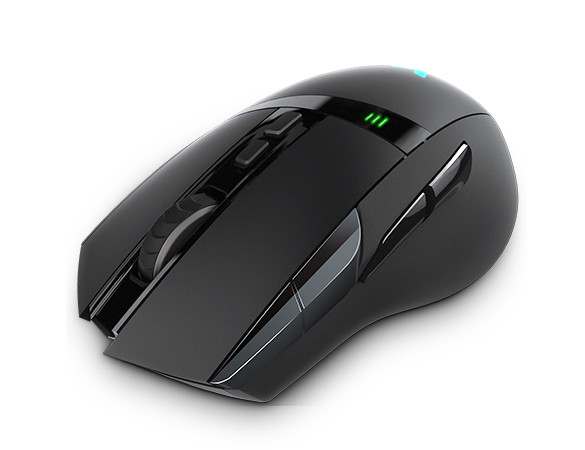 Your VT350 has an LED multi-color light system, which lets you customize the appearance of your mouse in many ways as well as to suit your preferences. The VT350 features an APM-lighting mode that reflects your actions per minute with a spectacular light show. Thanks to the built-in eco-friendly lithium battery, you can enjoy long battery life with a full charge. It eliminates the need for often replacing batteries.